NEW YORK, July 31, 2018 /PRNewswire/ -- Hacienda de la Paz, an incredible 7.4-acre, living "work of art" is now pending sale. This historic home was masterfully designed over 17 years to create an authentic 19th century Andalusian estate. The property was sold through global luxury firm Concierge Auctions. 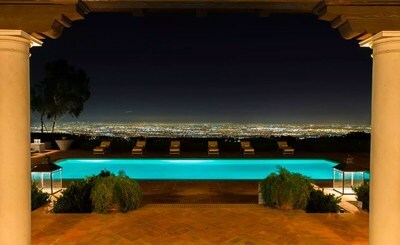 Overlooking the city of Los Angeles at the crest of the Palos Verdes Peninsula in the guard-gated city of Rolling Hills, the 51,000-square-foot estate known as Hacienda de la Paz is the only residence in the Americas designed by award-winning Spanish architect Rafael Manzano Martos, curator to Spain's royal family. It is the 36th largest home ever built in the United States and the second largest home ever built in Los Angeles. The awe-inspiring estate has nine bedrooms, 25 bathrooms, and is located in one of the wealthiest communities in America. The property was sold in cooperation with Jade Mills of Coldwell Banker Residential Real Estate and Jason Oppenheim of The Oppenheim Group. "My goal for this home was to build a true legacy property akin to the original Getty Villa or Hearst Castle. The architectural design spans centuries, and the amenities are beyond compare," stated the seller John Z. Blazevich. "I'm proud to have realized my vision and to have set so many records in the process." 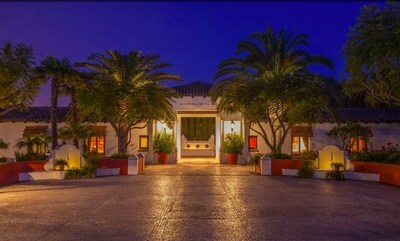 Hacienda de la Paz is pending final sale. When closed, the transaction will represent the highest price ever achieved in the city of Rolling Hills and the entire Palos Verdes Peninsula. This estate was designed to showcase three distinct periods of Spanish history and architecture on one site; the 19th-century Hacienda including Moorish gardens, an 18th-century Neoclassical grand ballroom; and a 10th-century Moorish hamam spa. The 210-degree panoramic views extend from the Santa Monica Bay, the Westside and downtown to the San Gabriel Mountains. "We were proud to present Hacienda de la Paz to our database of the world's most capable buyers," stated President and Co-Founder Laura Brady. "Our platform provides maximum exposure to affluent consumers interested in the finest luxury properties." "Hacienda de la Paz is truly one of the most incredible properties in the world. It was an honor to represent this estate," Oppenheim stated. Oppenheim also represented the buyer in this transaction. Mills added, "The new owners have acquired an irreplaceable work of art. 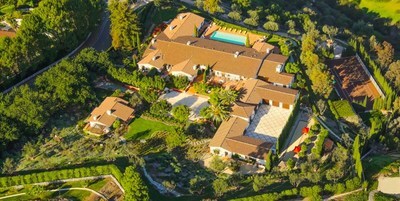 It was a pleasure to work with Concierge Auctions on helping find a buyer for this timeless estate." For more information on this property, and to view all properties for sale by Concierge Auctions, visit https://www.conciergeauctions.com or call +1.212.202.2940. Concierge Auctions offers commissions to listing and buying real estate agents. See Auction Terms and Conditions for full details. Concierge Auctions is the largest luxury real estate marketplace in the world. Powered by state-of-the-art technology, the company has generated nearly $2 billion in sales and is active in 38 U.S. states/territories and 19 countries. Concierge curates the best properties globally, matches them with qualified buyers, and facilitates transparent, market-driven transactions in an expedited timeframe. The firm owns what is arguably the most valuable, ultra-high-net-worth client list in real estate and has been named one of America's fastest-growing companies by Inc. Magazine for the past four years.